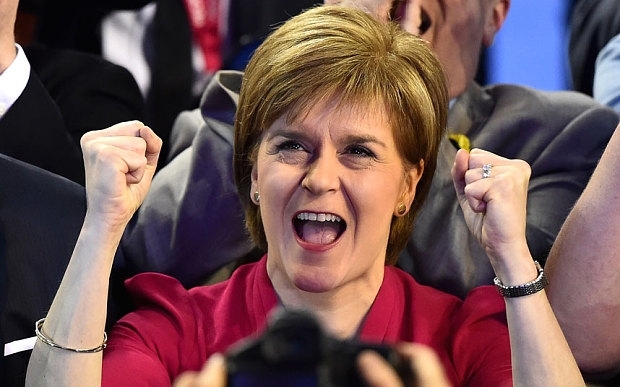 Nicola Sturgeon: exultant wind industry profiteer. A decade or so from now, when thousands of wind turbines are quietly rusting in some dimwit’s back paddock, the next generation will rightly ask why states and whole nations squandered $billions on a wholly weather dependent power source, abandoned centuries ago for pretty obvious reasons? Eventually, the spotlight will turn on the political enablers who made it happen. In Scotland, characters like Nicola Sturgeon and Alex Salmond have exhibited a maniacal obsession with wind power, which can only be explained through political ambition and financial gain (these days, the latter being essential to guarantee the former). Sturgeon and Salmond (indeed politicians of all shades) have benefited handsomely through donations thrown their way from foreign wind turbine manufacturers and foreign-owned wind power outfits.